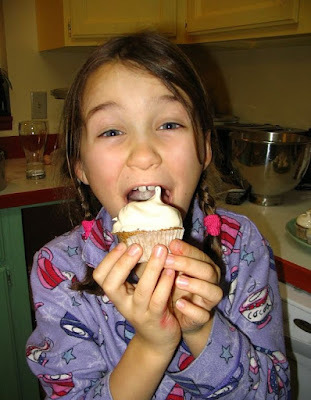 What to do when there is a birthday party at school complete with cupcakes? That has to be one of the classic problems of having a gluten free child. As a mom, you wish that they just weren't allowed. But the kid in you remembers just how exciting it was to have a sweet treat in school on your birthday. Somehow it seemed kind of illicit, exciting and oh so special. So what is a gluten-free kid to do when all the other kids are diving into the store-bought, icing an inch thick, cupcakes that are just poison to them? Well, if they have a mom who bakes at all, they can dive into their own wonderful cupcake. This easy recipe was created for just this purpose. The cupcakes freeze marvelously and the frosting whips together in just 7 quick unassisted minutes. The really nice thing about them is the wonderful spongy texture. They look and taste like wheat based cupcakes. The unique part of the recipe is the vitamin c powder used to pop the baking soda. It is an old trick of mine, I must have learned about it somewhere but can't remember where. By having a dry acid to react with the baking soda, the rising action happens just as the batter goes into the oven. I keep some of these in the freezer and when I get the email from the teacher alerting me to yet another classroom celebration, I get one out, thaw it while breakfast is cooking, frost and off it goes to school. Sometimes I end up being the Gluten-Free parent for a particular party. One daughter has two other classmates who follow a GF and Casein free diet. We moms talk a bit and so sometimes one of us packs enough for all three to share. So these have no casein either. All of the kids love them, even the typical eaters. Maybe it is the marshmallowy texture of the frosting or maybe they can't tell the difference. All I know is that my kids don't feel slighted by having to have their own cupcake. They feel special too. The chemistry of gluten-free baking is different from wheat based cupcakes. The use of vitamin C helps the texture tremendously. The classroom critics agreed, they loved them. 1.Preheat oven to 350. Prepare pans by greasing and flouring or lining with cupcake papers. 2. Combine dry ingredients in large bowl. 3. Beat eggs in second bowl, add oil and vanilla and milk choice, beat again. 4. Combine dry and wet ingredients. Stir together well so no area of dry flour remains. Remember no gluten = no tough, over-beaten cake. At least GF has one advantage! 5. Spread batter into prepared cake pans. 6. Bake for 20 minutes for cupcakes or 25-30 for cake pans. 7. Remove when browned and the cake has started to release from sides of pan. 8. Cool completely and frost with maple marshmallow frosting.